CV Graphics is a one stop carbonless shop for all of your carbonless paper needs. 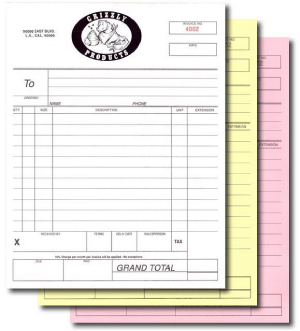 Not only do we provide all sizes and types of carbonless forms (half page, full page, legal, 2-part, 3-part, 4-part), we also offer fully customizable forms, including full color, printed to your specs so your forms are precisely the way you need them complete with your business information and logo. Our carbonless paper is guaranteed highest quality: we use 21 lb paper unlike some carbonless shops that use the flimsier 15 lb paper - and our discounts on high quantity orders are unbeatable. You’ll never need to shop anywhere else for all of your business’s carbonless needs.